I’m going to my cousin’s wedding in a few weekends time. The original intent was to make a dress to wear, but I’m finding the fabric selections at my nearest large fabric shop really boring.- I also traversed Brunswick St with no luck. 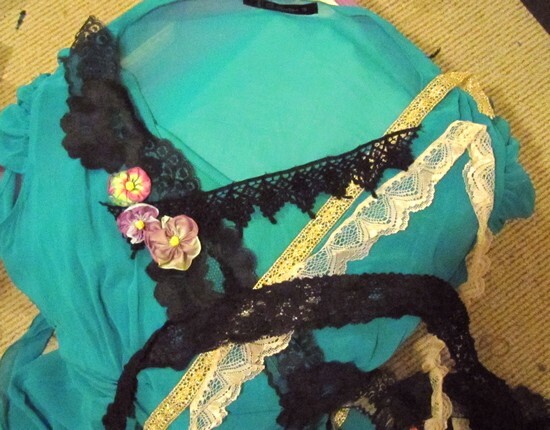 Luckily I picked up a plain green dress for a measly 20 dollars which I plan to embellish with a bit of lace and a flower or two. Think whimsical. Whilst the black looks quite heavy I’m leaning towards it as my shoe choices that will go with this green are either black or bronze. One of the braids is quite gold and while I like the effect it’s probably more suited to a Christmas party!